Quinault Indian Tribe and U.S. Army Corps of Engineers, Seattle District work to repair seawall from Brandi Montreuil on Vimeo. 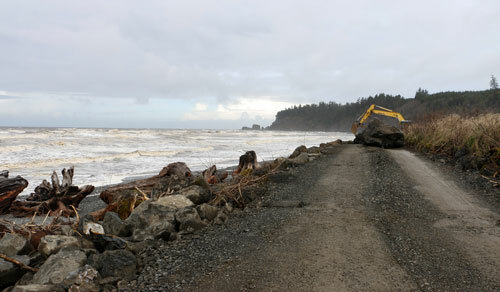 TAHOLAH, WA – Residents described the crashing storm waves like an earthquake hitting. Wave after wave broke over the weakened seawall that separates Taholah’s lower village from the raging North Pacific Ocean on the evening of March 25. During the storm, a section of the 1, 100 foot seawall failed, leaving residential properties and residents of the Quinault Indian Nation vulnerable to flooding. The following morning the destruction was clear. A smokehouse lay in a twisted shamble, other outbuildings, and properties were damaged and flooded, and the weeks’ weather report came in projecting rain, high winds, and 3 to 5 foot waves with 13 to 15 second swells by the weekend. Seven hundred Taholah residents faced an emergency. Fawn Sharp, President of the Quinault Indian Nation issued a voluntary evacuation, in which four families left the affected area. A request was also sent to the Federal Emergency Management Agency (FEMA) to declare the portion of Taholah affected as a federal disaster area and funds made available for disaster relief. Seattle District, U.S. Army Corps of Engineer Brian Stenehjem leads the Corps team assisting Quinault Indian Nation. He explains that wave action has damaged a 500-foot section of the seawall that separates Taholah’s Lower Village. The U.S. Army Corps of Engineers approved Quinault Nation’s emergency assistance request on March 27, and put the Seattle District Emergency Operations center into 24-hour operations. 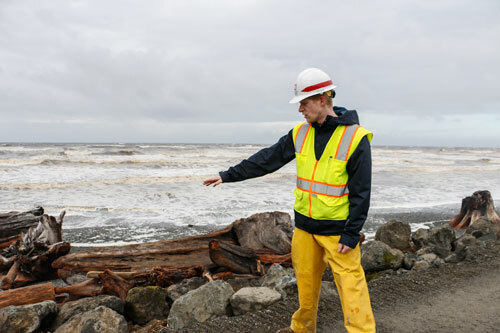 Teams were sent out to assist Quinault with temporary repairs to the failing 500-foot section of seawall, with a 48-hour completion date before an overnight storm coincided with high tide on March 29. During the Corps initial inspection of the wall, they reported calving of rock and core material due to wave action. During the March 25 storm, the wall sustained damage along the entire structure length, with the toe material of the berm removed and replaced with what protected the slope. This left the slope of the berm unprotected and vulnerable to waves and more removal of slope material, which if left unrepaired, would lead to a collapse of the berm’s capstones and loss of protection. U.S. Army Corps of Engineers, Seattle District has put its Emergency Operations Center into 24-hour operations to assist the Quinault Indian Nation with flood protection measures following damage to the Taholoah Lower Village seawall on Tuesday, March 25. 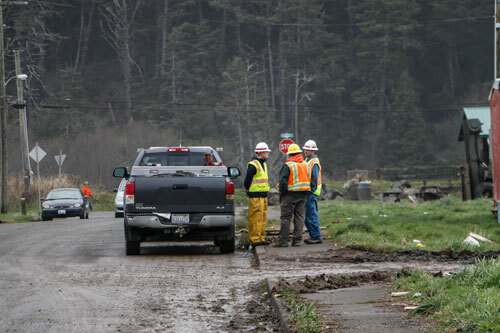 The repairs involved an orchestrated effort by Quinault’s Emergency Management, Quinault TERO workers, and the Army Corps of Engineers. 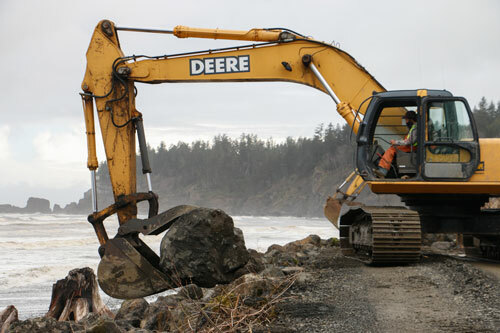 To make the necessary repairs, an access ramp had to be built to allow in excavators large enough to remove the capstones, and install a filter blanket and armor rock to prevent further erosion of the slope during wave action. “We first had to make an access route to work our way down to the filter blanket,” said Brian Stenehjem, Corps of Engineers team leader on the project, about the layer of material placed between the riprap [a layer of stone to stabilize an area subject to erosion] and the underlying soil to prevent soil movement into or through the riprap. Placement of armor rock was conducted on Saturday, March 29, which will help decrease the vulnerability to wave action to the slope. 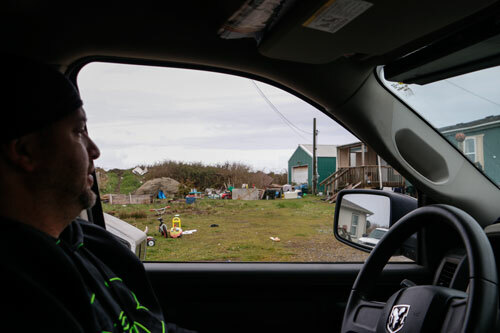 Quinault Emergency Management staff member John Preston, drives past a residence that sustained damage due to the breach on Tuesday evening, March 25. More than 100 dump trucks were used to haul in the armor rock, adding to the increased general council traffic, and annual clam-digging event during March 29 through 30. Despite issues with broken equipment and increased traffic, repairs were finalized on Sunday, March 30, costing $300,000 and resulting in the placement of 4,500 tons of rock. Corps teams remained on site throughout the March 29 storm to monitor the seawall conditions. The temporary repairs remained intact during the storm and prevented flooding to 700 residents in the affected area, including Quinault Indian Nation’s Tribal Police Department, animal control, storage facility for canoes, public work shops, Headstart School, and a retail shop and restaurant. “We wish to acknowledge and thank the help of the Corps of Engineers as well as Grays Harbor Emergency Services, the elected officials and all others who have sent their prayers and offers of support. Our people will be kept safe and we will continue to seek a more long term solution to this dangerous situation,” said Fawn Sharp. A permanent solution is being sought due to the encroachment of the North Pacific Ocean waters, which have become invasive over time due to sea level rise and violent storms. This entry was posted in Environment, Top Story, Tulalip News and tagged Amry of Corps Engineers, Fawn Sharp, Grays Harbor Emergency Services, Mel SHeldon Jr, Quinault Emergency Management, Quinault Indian Nation, Quinault seaswall, Quinault seawall breach, riprap, seawall breach, Taholah, U.S. Army Corps of Engineers by admin. Bookmark the permalink.